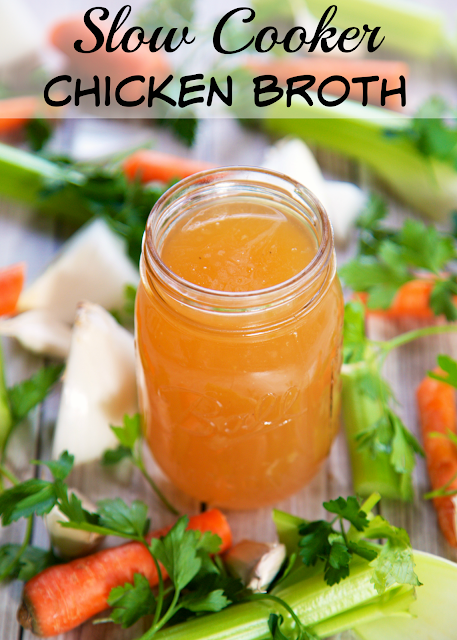 Slow Cooker Chicken Broth Recipe - don't throw away that rotisserie chicken after you eat it. Put it in the slow cooker with some veggies and water, 8 hours later you have the most flavorful chicken broth ever! You'll never use the boxed stuff again. Can freeze the broth to use later. One of our favorite shortcuts is using rotisserie chicken for dinner. They are inexpensive, taste great and so convenient. We buy a couple of chickens at Costco, come home and pull the chicken off the bones, divide the meat between two freezer bags and freeze the chicken for casseroles and soups. It makes dinner SO easy! We usually throw away the bones. The last time we bought some rotisserie chickens, Chicken Legs said we should make some chicken broth with the bones. I thought that was a great idea! This was SO simple. 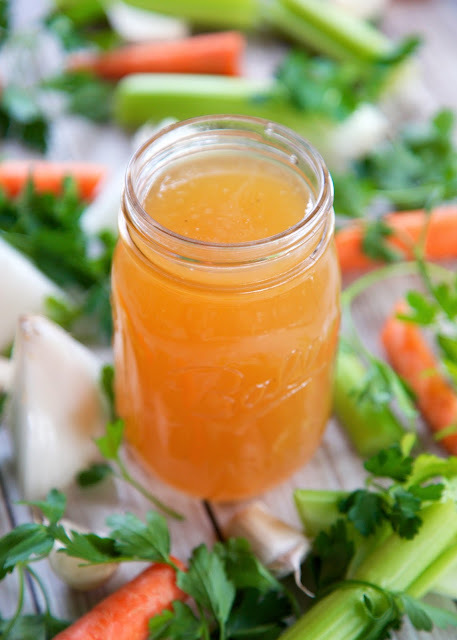 Just take the chicken bones, thrown them in the slow cooker, add veggies and water, cook for 8 hours and you have delicious chicken broth. It only cost a couple of dollars for the veggies and the chicken broth was WAY better than the boxed stuff. I've used this in tons of recipes and it makes such a difference. There is so much more flavor! This is a great way to get more for your money. The chickens cost $5 at Costco. We get at least 2 dinners (with leftovers) from the chicken and 8 cups of delicious chicken broth. You can put the broth in freezer bags and keep it in the freezer until you are ready to use it. We do this every time we buy chickens now. 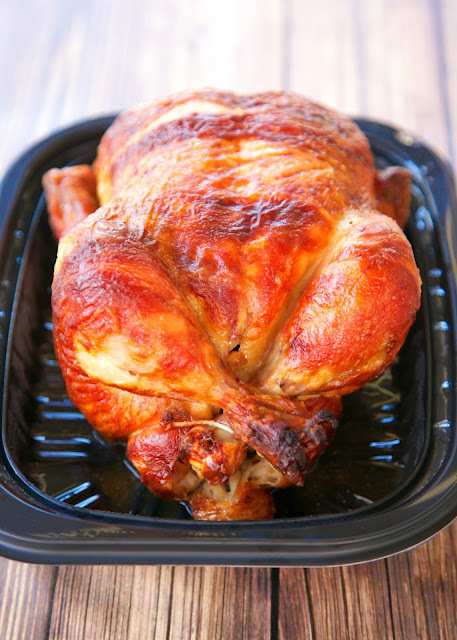 Give it a try the next time you use a rotisserie chicken. I promise you won't regret it! Pull the meat off the chicken and freeze it for later. Take the chicken bones and place them in the slow cooker. Place rotisserie chicken carcass in a 6-qt slow cooker. Add carrots, celery, onion, bay leaves, parsley, garlic, salt and pepper. Add water to fill the slow cooker - approximately 8 cups. Cook on HIGH for 8 hours. 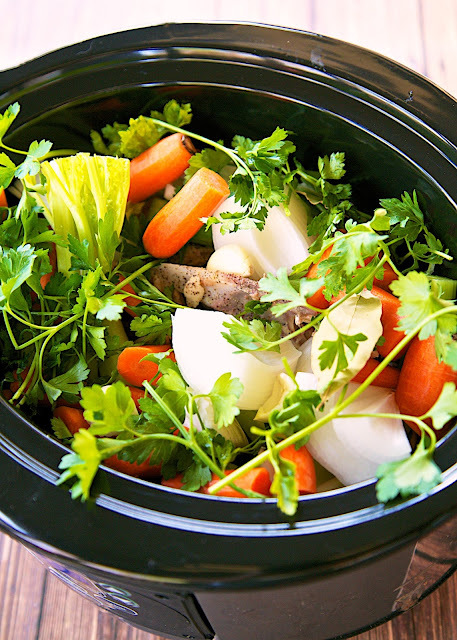 Remove chicken carcass from slow cooker. Pour broth through a strainer over large bowl. Throw away chicken bones and veggies. Store chicken broth in 2 cup containers, freeze. I always make chicken broth from rotisserie chicken but never thought to do it in a crock pot. I will try this next time! Thanks for a great idea. Great idea. I add celery and coarsely chopped onion too. If you don't add garlic, you can use the carrots in homemade dog food or add the carrots to pasta sauce. Too much garlic is not good for dogs. I put chopped veggies in the crockpot, just barely cover with water, then plop a whole raw chicken on top, cook on low for 7-8 hours. i take out the chicken when done, pull the meat off the bones and toss all the scraps back in the crockpot, add 4-5 cups water and simmer overnight, about 12 hours. In the morning, I divide out the broth into 2 cup portions and place in ziplock bags. My dogs love the carrots! The chicken meat will usually be used in enchiladas.